Despite its rural location, the business has undergone healthy growth since its inception but recently has come under pressure from low cost Chinese imports. 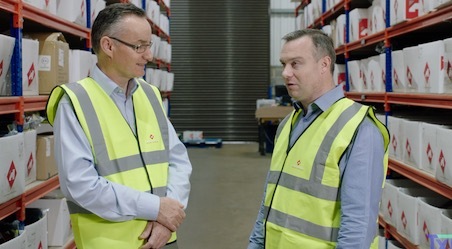 Managing Director Phil Joyce realised that the way to compete was to offer customised doors made to order in the same lead time offered by the ex-stock Chinese product. Having seen a presentation by TXM Coach Tim McLean on the advantages Lean approaches can deliver, Larnec engaged TXM. A Tailored Advisory Service Grant from Enterprise Connect assisted Larnec Doors in implementing the program. TXM started by developing a value stream map of the process for manufacturing Larnec’s two main door lines. The map revealed that the lead time to manufacture a door was between 10 and 12 days, much more than the four days that the business needed to achieve. Figure 1 – This kanban system controls daily production in the sheetmetal shop, ensuring that parts do not run out while reducing inventory and eliminating the need for managers and supervisors to spend to day expediting jobs. With coaching from TXM Consultants, Tim McLean and Anthony Clyne, the Larnec team developed a future state map and action plan for the business outlining the changes needed to achieve its lead time target. The changes were major and Larnec took action quickly. Working with the TXM consultants, the team developed a new plant layout which involved relocating key machines, creating a natural flow of production from punching to folding to robot welding. Integrating assembly with product packing and despatch freed up a factory building previously used for despatch only and eliminated double handling. 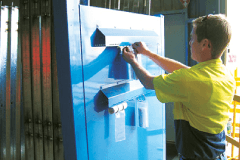 A Kanban system was set up to trigger manufacture of door jams in the metal fabrication area and specially designed kit trolleys transport small batches of products through assembly on an hourly basis. To support the system TXM coached the Larnec team on implementation of 5S to organise the workplace and structured problem solving techniques to discover and correct the root causes of problems on the shop floor. Larnec achieved productivity improvements of up to 50%, remains committed to continuous improvement and is now extending its lean production system into the manufacture of wooden doors and their range of Champion Horse stable partitions.